Scanning is easier because the finished paintings lay flat. I save money because I can use lighter weight paper i.e. less-expensive paper. Note: you can stretch heavier weight watercolor paper if you want to. 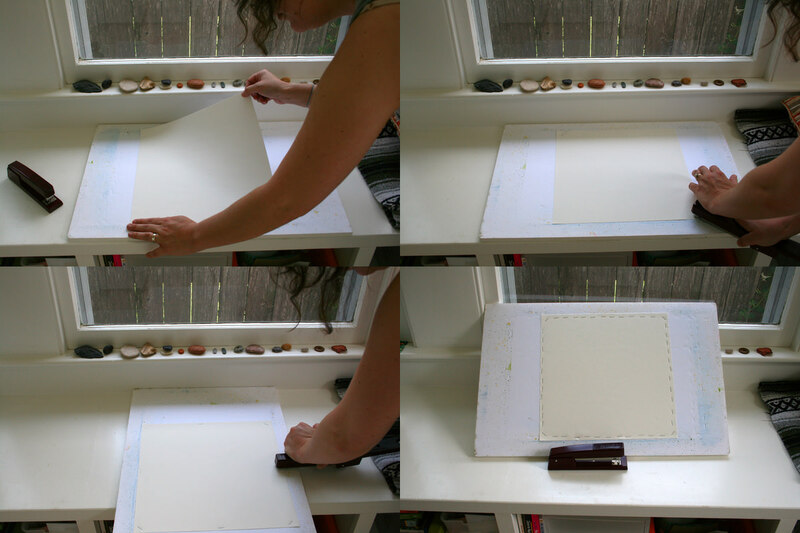 Note: If you want to trace an image on to the watercolor paper before it is stretched, you can. I even print onto the paper before it’s stretched using a printer that has pigmented inks that don’t run. #1. Before you soak your paper have out: your 1/2″ thick foamboard, stapler (full of staples), paper towel roll, and a double layer of paper towel laid out on your work surface. #2. Have your bathtub fulled with 6″ of cool water (not warm or hot). Slide your watercolor paper into the bath till fully submerged. Let paper sit in bath till the paper is thoroughly wet but not floppy. Pull the paper out of the bath and let the excess water drip off. I use Arches HP 90lb. watercolor paper and it takes less then ten seconds to get the paper soaked. #3. Lay the soaked watercolor paper on top of your paper towels, then put one more layer of towels on top of the paper. Blot the paper (never rub) till it’s lost its watery shine. #4. Place the blotted paper onto your foamboard taking care to ensure it lays flat. Now you will begin stapling the paper directly to the foamboard. Swing the stapler open and start stapling the paper at diagonal corners till all four corners are stapled. Then staple in the middle of each side switching to opposing sides for each new staple. Essentially, you just want to make sure you are stapling equally on all sides. Fill in the spaces between the staples with more staples. I tend to use a lot of staples, each one is roughly 1/2″ apart. Now your paper is stretched! Yay! If you would like to paint right away you can do a wet-on-wet technique. 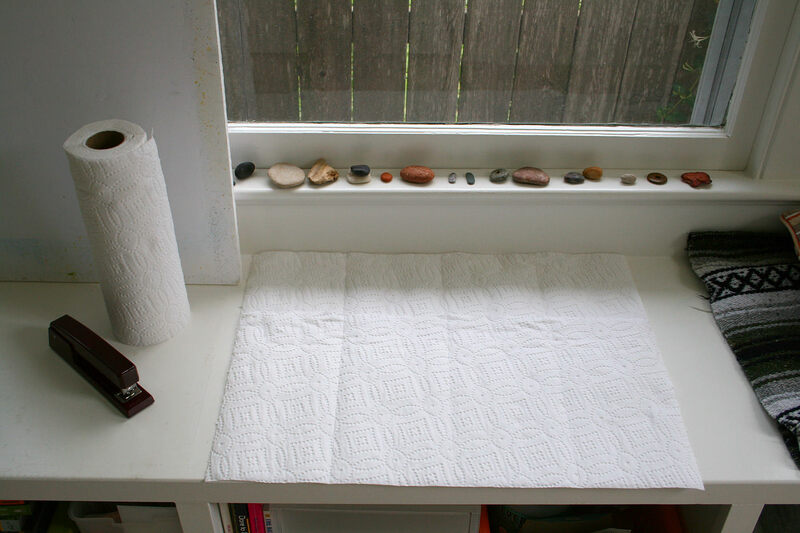 If you need the paper to be dry, just lay it flat on a surface that is out of direct sunlight and heat. Once dry, the paper will be drum tight! For my 90lb. paper, drying takes between 15-30min. depending on how much humidity is in the air. When you are done painting wait till the paper is totally dry, then remove the paper from the foamboard. I shimmy a thin butter knife under the paper that is directly under the staples to pry them up. After you pry up all the staples you can pull the paper off the board, then pick the staples out of your paper with your fingers. Your paper will have holes on the edges, which you can cut off to get rid of the holes. Don’t let the looks of a used foamboard surface scare you. Your board will still be good even after multiple uses. Just run your hand over the surface and knock off any high points. Yes, stretching paper does use up paper towel. I reuse my paper towel for dabbing my brushes on. Side Note: I think proper paper handling is important. When you bring your watercolor paper home, store it flat. When handing the paper, use clean hands. When you pick up the paper, hold it from two diagonal corners. This prevents body oils from transferring onto the working-area of the paper, and keeps your paper damage free. Special thanks to fellow artist and Girllustrator, Amy Farrier, for the use of her house and camera. Thanks, Amy! Excellent demo, Marsha! Maybe I’ll try stretching my linocuts before I paint them. I print on really heavy paper so they don’t get much of a wave after painting with watercolor, but it does happen a little bit. Thanks for the comment, Jill. As for stretching your linocuts I would recommend stretching the blank paper first, then print, then paint. Otherwise, your printing inks may run in the soaking bath. Unless, you are using water-proof ink, which you might be using since you watercolor over them. BTW, I love those rocks too, but alas, those are my friend Amy’s rocks not mine. 🙂 She let me take these photos in her house using her camera. Thanks, Amy! Marsha! This is an awesome post, thank you so much for sharing..and for the visuals. And, goodness, thank you for your kind visit today…it means a lot! Interesting. I have never seen paper stretched this way. I stretch paper using watercolor tape instead of staples. I will have to try this method too though. 🙂 Have you tried using tape? Thank you so much for taking the time to create this page. I did just as you instructed and am really pleased with the result. The whole tape bit just doesn’t agree with me. I find staples much more straightforward. Good information, concisely presented. I have been wanting to try using staples for stretching my watercolors for some time. Now I know what size to use. What size staples do you use please and thank you for posting this. Well that makes it much easier than the Staples I was using, heavy duty staple gun nonsense! I tried to use the tape my daughter bought me last night. Boy is that stuff a pain/ mixed results. Where did you get your gator board also? All I can think of doing is ordering it online as I am in art supply wasteland out here in… California unless is it is at Michael’s, Aaron Brothers or Hobby Lobby. I am so embarrassed that we don’t have art supplies available out here! You would think we were just out newly formed state! I keep getting tears along the side when I’m stretching my 140 lb. I haven’t been blotting, that could do it right? And 90 lbs? You are a boss! If I can master this I can buy 90 and save tons!